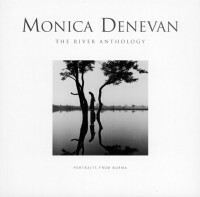 My first glimpse of Monica Denevan’s photographs caught me entirely by surprise. I found myself simultaneously drawn between two extremes of interpretation. Immediately beautiful and compelling in their composition, I had the feeling that I was looking at a collection of vintage fashion photographs. And yet, here surrounding these graceful forms was the powerful and compelling landscape of Asia, with all its haunting, mystical appeal.